This month marked the first National Summit on Teacher Leadership, a joint effort of the AFT, the Council of Chief State School Officers, the National Education Association and the U.S. Department of Education. 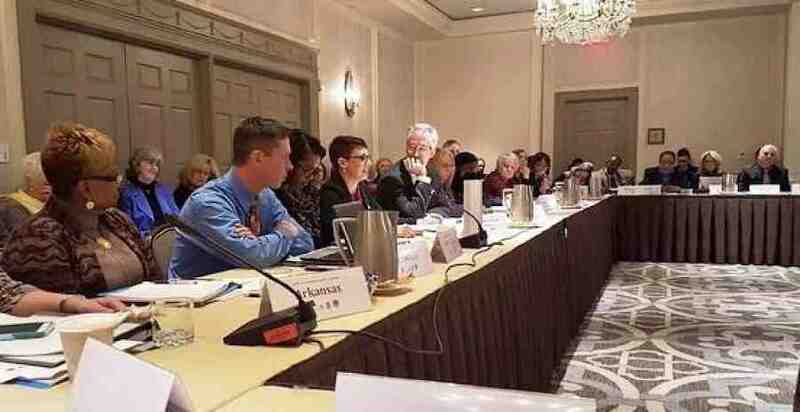 The organizations brought together delegations from 19 states—each made up of state, union and teacher leaders, to discuss the policies and supports needed to expand genuine teacher leadership in America’s public schools. The Feb. 6 event in Washington, D.C., was initiated as a result of a commitment made by the four national education organizations that served as the official U.S. delegation to the International Summit on the Teaching Profession last March in Canada. Acting Secretary of Education John King kicked off a discussion about the importance of teacher leadership in elevating the teaching profession and contributing to broader education policy development. CCSSO Executive Director Chris Minnich highlighted the policies and supports necessary at the state level to promote the transition to effective teacher leadership in schools. AFT President Randi Weingarten and NEA President Lily Eskelsen García, drawing on their experiences as teacher leaders in and out of the classroom, discussed the need to propel the growth of teacher leadership by creating an infrastructure for authentic teacher voice to be heard and revered. AFT teacher leaders came from Connecticut, Florida, Illinois, Mississippi, Missouri, New York, North Carolina, Ohio, Pennsylvania, Rhode Island, Texas and Utah as well as from AFT locals overseas. They moderated and participated in working group discussions—diving deep into such questions as what systemic changes are required to create a culture of authentic teacher leadership. The frank comments and exchange of information around the tables bodes well for the work that will continue in the months ahead, reports Kiragu Beauttah (pictured with Randi Weingarten), a Baltimore middle school science and special education teacher who served as a session moderator and participates in the AFT Teacher Leaders Program through the Baltimore Teachers Union. 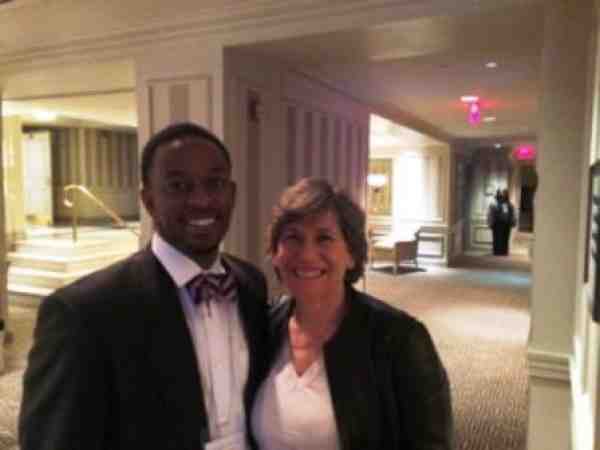 That work is well underway at the AFT, Weingarten told one audience, and she pointed to the AFT Teacher Leaders Program as a prime example. The program brings together a select group of teachers throughout the school year to learn how to take active leadership roles in their schools, unions and communities. It promotes the goals of the local unions and provides, among other things, a strong tie to the community, an informed teacher voice, and a vehicle for positive messaging about public schools and unions. Roughly 400 educators have participated over the four years the AFT Teacher Leaders Program has been running, and 14 AFT affiliates are participating in 2015-16. Four leading education groups brought some of the best and brightest minds from around the country to the 2016 National Summit on Teacher Leadership in Washington, D.C. on Feb. 5-6 to turn ideas into action and empower more educators to lead their professions. The National Education Association (NEA), along with the American Federation of Teachers (AFT), Council of Chief State School Officers (CCSS0), and the U.S. Department of Education, organized the summit to allow participating teachers, state superintendents, and union representatives to share ideas, best practices, and examples of existing teacher-leadership efforts. Additionally, the group identified common challenges and created concrete, actionable teacher leadership plans to address them back home. Nineteen states were represented at the summit, and included an education team from the U.S. Department of Defense. Educators and leadership is a combination that makes sense because teachers are the experts, said Aman Dhanda, a sixth grade teacher from California, now serving as a Washington Teaching Ambassador Fellow for the federal education department. For Deborah Hollis, a sixth grade English Language Arts teacher at Molasky Jr High School in Clark County, Nevada, the summit was an eye-opening experience. Hollis explained that being a teacher leader doesn’t mean you have to leave the classroom and become an administrator. Leading the profession could be sharing with other educators something that is working well in your classroom and inviting them to observe—“that’s a teacher leader,” explained Hollis, who has been in the classroom for 14 years. Often new policies and initiatives are introduced in schools without the infrastructure to support it or the input for those who are expected to implement these policies—educators. Karuna Skariah, a National Board Certified Teacher and an instructional program coordinator for Prince George’s County Public Schools, has a solution for that. Skariah and a group of teachers have been working with the Education Department to establish a Teacher Advisory Council. The council is being designed to give more educators decision-making authority. The group has already created a model and has presented their proposal to district leadership. One of the key elements to the council is for it to be solutions based. The team is scheduled to present their proposal to a larger group, where they can begin to put the council in motion. This year’s national summit on teacher leadership stemmed from the 5th annual International Summit on the Teaching Profession held last year in Canada, where education ministers and leaders of teachers’ unions and associations gather to discuss education issues. The 6th annual summit is scheduled for March in Berlin.